The Thermost® Insulated Shopping Bag will keep your food cold (or hot) for up to five hours! The insulated canvas bag can be used for grocery shopping, picnics, medication, car trips or anytime you need to keep items either cold or warm. The inside of the bag is lined with thermal insulation to maintain the temperature needed. It has a tight zippered closure. In addition it has a side pocket with a snap button closure. 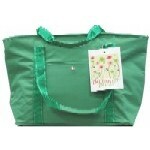 The insulated bag is made of quilted, poly-fiber filled nylon fabric. It has the feel and look of canvas. And it will hold up like canvas for years of use. The Thermost Bag comes in six colors! 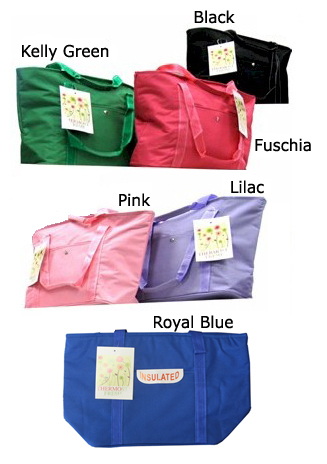 Fuchsia, kelly green, pink, lilac as well as navy and black. 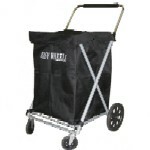 The bag can be used alone or as a companion piece with the Canvas Swivel Folding Shopping Cart with its matching colored liners. Click on "more pictures" above to view the companion shopping cart.